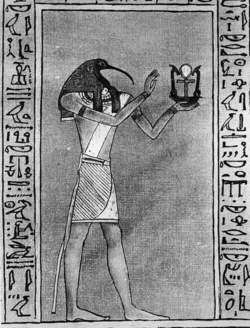 The ibis-headed Thoth, an Egyptian god, holds an ankh. Courtesy Fortean Picture Library. Also known as the crux ansata, the ankh is a tau cross with a loop above it. It seems likely that the loop represents the female sexual organ and the tau cross the male. For this reason the ankh is considered a symbol of life, fertility and regeneration. DeTraci Regula suggested that it is derived from an African fetish doll of the type used to promote fertility. Count Goblet d'Alviella suggested that it derived from primitive Phoenician and Libyan images of the Goddess, as a narrow triangle surmounted by crossbars plus an oval head. The ancient Egyptian word ankh means both "life" and "hand mirror." In Egyptian art, the ankh is carried by virtually every deity, symbolizing the gift of eternal life which they promised to their worshipers. The loop was frequently painted red and the cross white. There are many scenes of the ankh being applied to the nostrils of the dead, to bring them back to life. The ankh is a common talisman, for protection and for fertility, and is worn by many Wiccans. The Church of Wicca, based in a Welsh-Celtic tradition founded by Gavin and Yvonne Frost, uses—perhaps surprisingly, considering their background—an ankh as one of their working tools. They have both a standard ankh, for individual use, and a grand ankh, for coven use. Each is made of wood, usually willow fronds. The tool is used much as other traditions use the coven sword. The standard ankh is measured from the inside of the loop at the top to the base, and should be 2 feet, 8 1/2 inches. This is described by the Frosts as "one megalithic yard." The coven ankh is two megalithic yards or 5 feet, 5 inches. There are some Wiccan traditions that are based on ancient Egyptian beliefs and teachings, which use the ankh in various ways. Most common, however, is as jewelry and/or talismans. Contrary to their intention, Kapp said the ankhs were at first displayed behind fences at Frankfurt. Everywhere you look (in hieroglyphics), there is rope twisted around the crossbar of ankhs,'' she says. There're so many Sisters with Ankhs tattooed on them and head wraps that when I was in Africa, in Cape Town and Soweto, they called the head wrap the 'Badu,'" she says laughing. Oh, but not really -- this is just the bright, historically inaccurate daydream of the period that might pass through the minds of the kids in the museum as they stare at those neat ankhs and amulets. Finely made key-shaped objects, known as "eccentrics" and bearing an uncanny likeness to Egyptian ankhs, are found commonly in royal tombs and cenotes. She believes ancient Egyptians used ankhs to hold strings of kites used with pulleys to ``fly'' huge stones.